Alan Flusser’s tailoring for Wall Street forever reshaped the way the world’s financial titans (and star Michael Douglas) dressed. 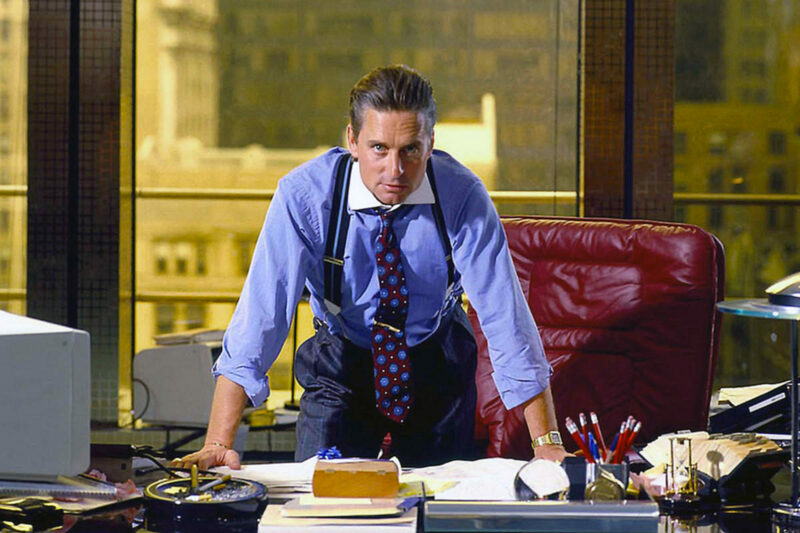 Michael Douglas wears a contrast collar shirt with checked pleated trousers, braces, a printed tie and silver tie bar as ruthless financier Gordon Gekko in Wall Street, 1987. Photograph by Collection Christophel/Twentieth Century Fox/Alamy. Just as the style of Francis Ford Coppola’s classic The Godfather is all about Michael, the look of Oliver Stone’s financial ‘Icarus’ story Wall Street is defined by another gentleman of the same name — Michael Douglas, the actor who channelled rapacious insider-trading corporate raider, Gordon Gekko. Gekko’s gear, which ate up almost a fifth of the 1987 film’s wardrobe budget, was created at the behest of legendary Hollywood costume director Ellen Mirojnick by New York arbiter elegantiarum, Alan Flusser. Flusser isn’t strictly a designer, though he does design clothes (and indeed, picked up the 1985 Coty Award for America’s Best Menswear Designer). Nor is he a tailor, despite the fact you’ll find his name above the door at a 48th Street custom menswear shop. Instead, Alan Flusser could more accurately be described as a gentlemen’s garment guru, a haberdashery swami, a menswear spirit guide. Which is exactly the role he played dressing Douglas for what would turn out to be the actor’s most memorable role. 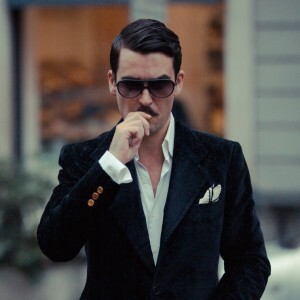 Flusser’s menswear how-to tome Dressing The Man is — alongside Bruce Boyer’s Elegance, Hardy Amies’ ABC of Men’s Fashion, and Bernhard Roetzel’s Gentleman — one of the key texts The Rake’s editors have referred to for men’s style wisdom ever since this publication’s foundation. Written, according to Flusser, in order to “inform, teach, educate, and generally demystify the rare art of masculine dressing”, we highly recommend you pick up a copy. Absorbing Flusser’s incisive advice on cut, colour, cloth, fit and proportion is like that scene in The Matrix where Neo emerges from a short spurt of intensive training and says, “I know kung fu.” Basically, reading Dressing The Man will make you a men’s style grandmaster. Most of us have to study the sartorial arts. Flusser, meanwhile, was seemingly born with an innate gift. The son of a snappily-dressed real estate exec — “my father was something of a dandy,” Flusser once said, a man who “believed you had to look successful” to be successful — the adolescent Alan got his start giving out styling advice to those who sought it. Founding his eponymous company during the late 1970s, Flusser really hit his pinstripe stride in the power-suited ’80s, outfitting the US political elite (dandified arch-conservative Machiavelli Roger Stone calls Alan “my sartorial mentor and the total arbitrator of good taste”), captains of industry and international financial players in his tastefully audacious style. It was his popularity among real-life Manhattan ‘Masters of the Universe’ that led to Flusser being given the Gekko gig. When Flusser was first introduced to Douglas, he found the actor personally favoured a dressed-down Californian look. To assume the role of Gekko, his sartorial stance would need an utter transformation. Over the course of three weeks at his haberdashery, Flusser took his new protégé in hand, fitting him for a dozen suits, twice as many custom-made shirts — not a few boasting bold horizontally-striped bodies and contrasting white collars and cuffs, as Flusser himself favoured — and selecting a cornucopia of complementary Italian-made silk ties. The braces that came to be a Gekko signature (much emulated by up and coming traders and aspiring corporate raiders of the day) were in fact a necessity, Flusser explained in a 1988 People magazine interview. “Douglas is very thin through the hips,” he said. “If he hadn’t worn suspenders, I doubt his pants would’ve stayed up.” Just as those aggressively pleated trousers were designed to give volume, swagger and gravitas, slight padding was used in the shoulders of the actor’s shirts to give him a heroic silhouette, while wider cuffs and sharp pointed collars were employed to provide Douglas with “more powerful proportions,” Flusser noted in the same story. Testament to the success of Flusser’s transformation of the previously laid-back Cali dude’s sartorial mindset, Douglas is said to have loved the strutting, superhuman Gekko wardrobe so much that when filming on Wall Street wrapped, he packed the garments up and shipped them home. Whether the yellow-gold Cartier Santos Douglas sported in the movie also made its way into his possession is unclear, but its reappearance in 2010 sequel Money Never Sleeps indicates that it’d been well looked after. A refresh of the model was presented by Cartier at this year’s SIHH watch fair — and, along with those stripes, suspenders, power shoulders and pleats, it is an essential accoutrement for any gent looking to rock Gekko-esque ubermensch style today.